Hmmm … it would seem I have returned to cheesecake experimenting. 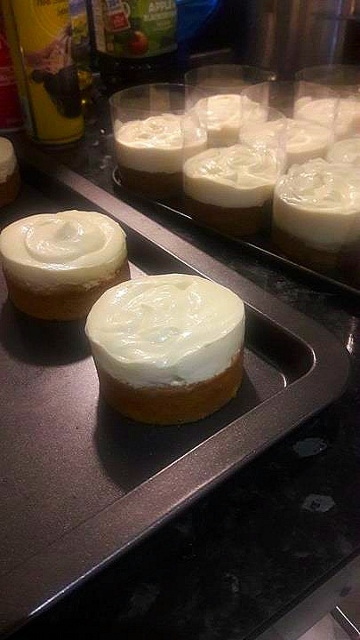 After last weeks success I decided to continue on with this less than conventional version using mini banana nut bread as the base and allowing the cream cheese to feature more prominently as a cheesecake rather than just an icing. It was also a good way of testing out my new 12-hole loose bottom pan (which I absolutely LOVE). Details of the pan will be listed below. I do like my banana but bread recipe and whenever we have bananas lying around I feel tempted to dump it into a pan and bake this cake. I don’t usually like nuts in my desserts, but this one is the exception. 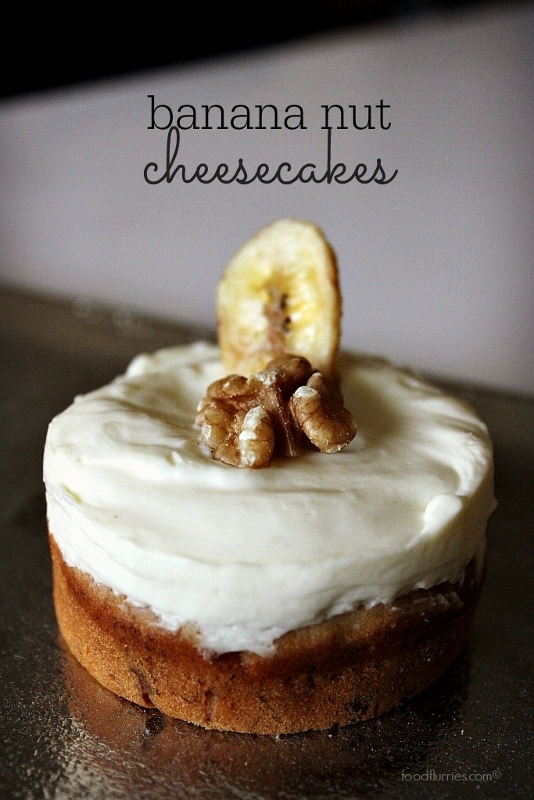 In fact, if I didn’t add the walnuts I would feel like this cake is just not complete. I had to do this in two steps. 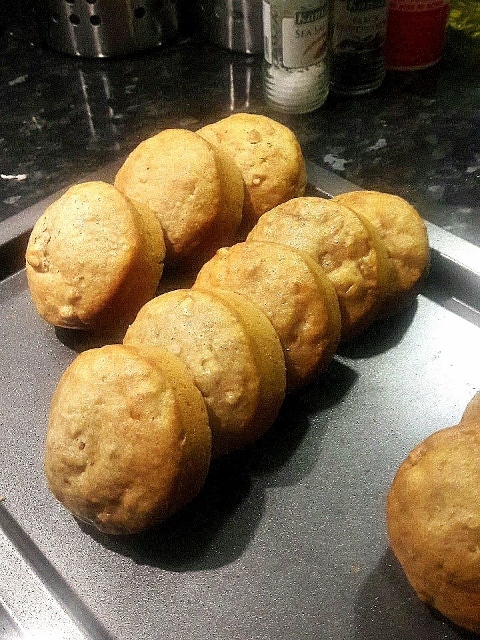 First bake the cakes a day in advance, then top with the cream cheese the next day. Start by placing the butter, brown sugar and honey in a heat proof dish. Either microwave for 1-min or set on top of a double boiler to melt the butter and sugar granules. Stir with a whisk until you get something that resembles thick caramel sauce. The mixture should be warm but not boiling. In a separate bowl, mash the bananas and whisk in the eggs and vanilla. Once the buttery sugar mixture comes off the double boiler and cools down a bit, dump in the bananas and egg mixture. Whisk gently until just combined. Add all the milk. Sift all the dry ingredients together: flour, baking powder, baking soda, salt. Dump everything in with the wet ingredients and whisk gently. Finally add the chopped walnuts and fold in to the batter with a wide spatula. Place into individual moulds and bake in a pre-heated oven for about 20 mins. The tin I used is a non-stick mini cake pan but I still used a hint of PAM just to be sure. Remove from the cake pan after baking and allow to cool completely on a wire rack. The next day all I had to do was make the cream cheese topping and assemble everything. Cream cheese topping is fairly straight forward. Bloom the gelatin in a glass of cold water. In a mixing bowl place the softened cream cheese, cream, vanilla and condensed milk. Mix on medium speed until combined. If you like your topping sweeter then feel free to adjust the amount of condensed milk. 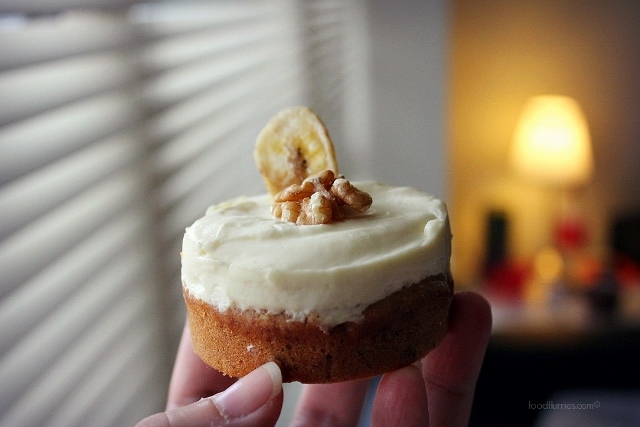 I kept my topping fairly tart to offset the natural sweetness of the cake from all that banana and honey. Pour hot water or hot milk into a small cup and add the gelatin leaves to melt. Quickly add this liquid to the cheese mixture. Spoon the cream cheese mix into a large piping bag and set aside. 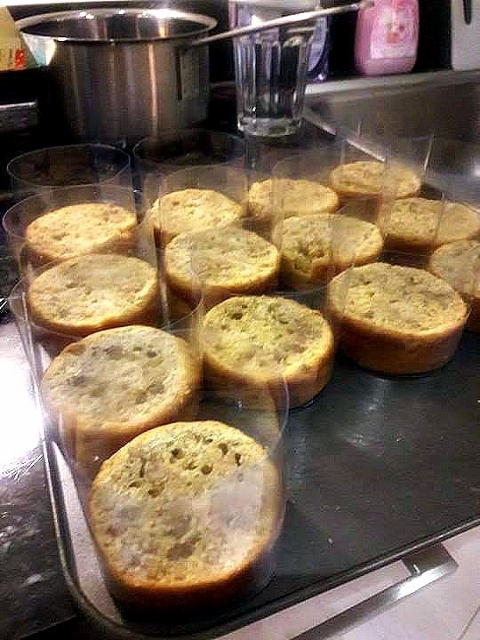 Now I had intentions of trimming the tops of the cakes, placing them back into the cake pan and simply topping everything off with the cheese mixture and shoving the entire tray into the fridge to set. However, when I placed the cakes into the pan I discovered that they had shrunk slightly around the sides thus leaving a gap. No way could I pour cream cheese over them like this now without it covering the sides of the cakes as well. Sighhh …. I hate snags like this. So now I had to improvise by wrapping each cake with acetate and taping the seams shut. More work but necessary to have a fairly snug fit around the circumference of the cake. Spray lightly with PAM for easy release. Squirt the desired amount of cream cheese topping onto each cake. Shake the sheet pan vigorously and tap on the work bench to expel air and settle the mixture. Chill in the fridge for 4-hours or over night before unwrapping each one. Decorate as you please. I just used dehydrated banana chips which I got from a health food store and some extra walnuts. Was very tempted to add salted caramel sauce but refrained because again I did not want to add more sweetness … but you can do that, obviously, if you like a sweeter dessert. A simple dessert but an effective one. Versatile to be served at tea parties, birthdays, taken to the office or simply for no reason at all. Enjoy these little babies alone or with friends and family.